"This is a simple rice stir fry that is easily made vegetarian." Heat the vegetable oil in a wok or large skillet over medium high heat. 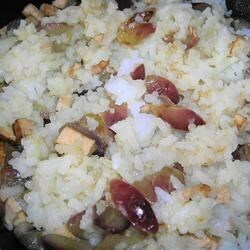 Stir in the grapes and chicken; cook and stir until the chicken is hot, and the grapes are tender, about 3 minutes. Add the rice and chicken broth; continue cooking until the rice is hot, about 2 minutes more. Make this vegetarian by substituting marinated tofu for the chicken, and vegetable broth for the chicken broth. Loved the simplicity, however, it was pretty tasteless. I think it could use onions and garlic for a start. This was pretty good the first time around! It doesn't warm up well though, so don't make enough to have leftovers! Definitely a unique combination of flavors! I used brown rice and fat free chicken broth.